Mary Moore has opened an eponymous vintage clothes boutique to revel a lifetime's worth of collectable clothes. With thousands of dresses from years of avid and discerning collecting you will find rare pieces from places as far flung and diverse as Los Angeles, Capetown, Florence and Cornwall. 1950's cocktail dresses in velvets and taffetas: daring 1970's prints in chiffon and 1960's tweed coats a la Hepburn are found in fabulous condition. Mary Moore Vintage is a sensory pleasure from the moment you step into the store: from the weekly changing selection of clothes to the handpicked archive wallpaper, the emporium gives an injection of vintage glamour to the neighbourhood. To find out about the latest treasures available online go to items for sale. 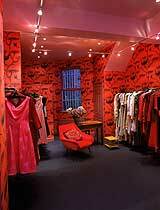 Mary Moore Vintage has become a must for designers, celebrities, and both international and local clients. Mary's obsession and experience with fashion well equips her in finding your absolutely perfect dress or outfit. She offers private consultations by appointment at the shop and her ability in finding the right thing for you is unquestionable, even if you have never worn vintage. Contact us to arrange a personal consultation. There is a tailor on call to make any necessary alterations to ensure your purchase is an exact fit or if you fall in love with the style of the dress and long for an different colour, a new dress may be created for you. Mary was born in 1946 to sculptor Henry Moore and Irina Moore, their only child. She spent her early life in the family home, Hoglands, where she was surrounded by her father's work, a diverse art collection and the daily process of creation in a sculptor's studio. The house was also furnished with Henry Moore's textile designs, produced by Asher. Mary's mother, an art student with a talent for constructing beautiful clothes had an innate sense of style that significantly influenced Mary. This creative upbringing ignited a lifelong passion for fashion and design in Mary. 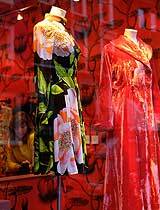 In Sixties Mary joined her friend, Lynn, to work for the bespoke shirt maker, Deborah & Claire on Beauchamp Place. It was at this time that she began to follow her enthusiasm for fashion through to its logical conclusion, designing shirts and dresses with Lynn under the name Lynn & Mary for a range of clients, including the band The Animals and Eric Clapton. One of their designer shirts features famously on Eric Clapton's Leila album cover. During this time Mary honed her natural artistic talent and spent some time as a photographer on several magazines including It and Oz shooting various bands like The Soft Machine. In 1977 Mary's commitment to art and her close relationship with her parents led to the creation of the Henry Moore Foundation. She is currently working in conjunction with them on a project to co-curate her family home. 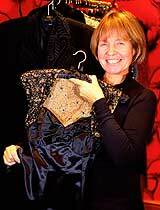 In the late nineties, Mary was the first person to introduce vintage clothes into the mainstream via Liberty under the name Macy Moore Vintage Couture. This was shortly followed by a concession in Whistles during 2000-2001. Mary always knew that she would eventually open a shop and having found the right place she has now opened the doors to the public and allowed them both a unique insight into here exquisite taste and the opportunity to purchase some rare finds.